I had to get back into the studio over the last two weeks – I felt like I needed to put some of my development work onto clay after all the work on paper I’d been doing at home…plus, I have shows coming up in November that I need work for! 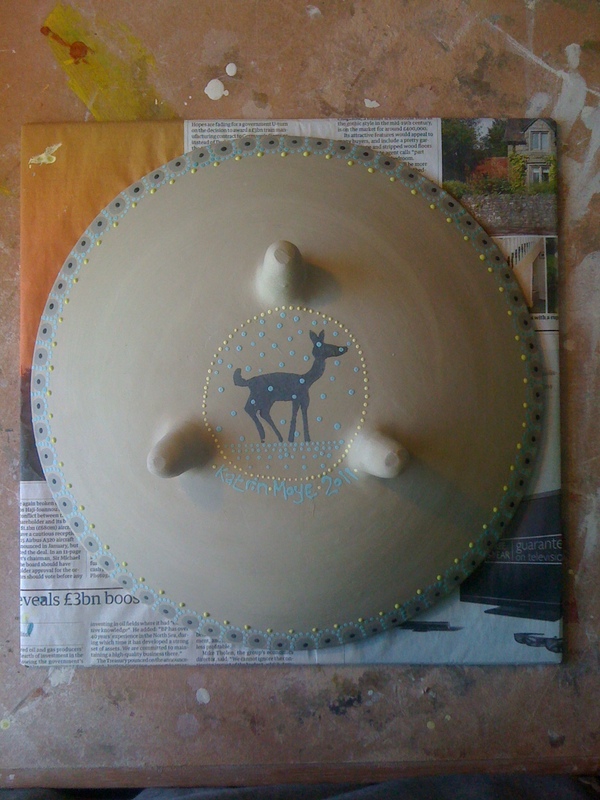 I am going to ‘Lustre’ at the Lakeside arts centre at Nottingham University on the weekend of 5th and 6th November, and ‘Made’ in Brighton on the weekend of 17th – 20th November. I would very much like to see you at either of these lovely shows if you can make it! 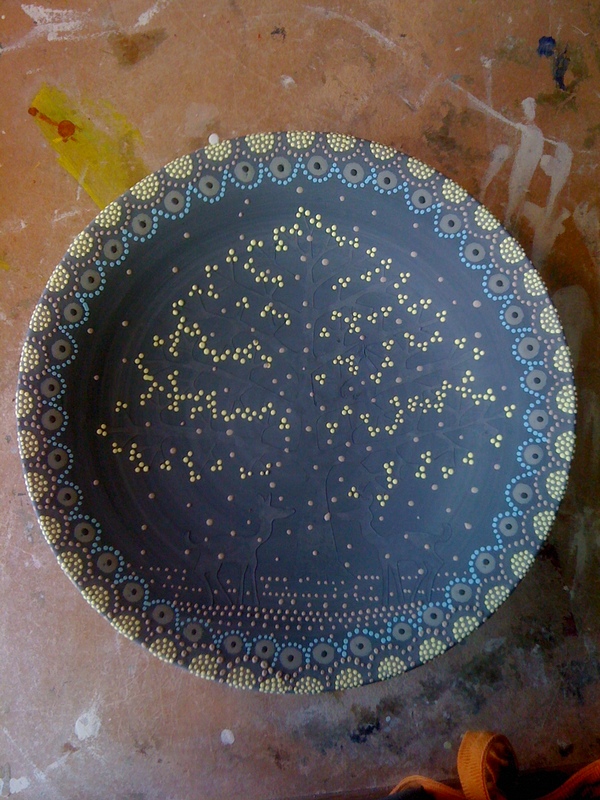 When I was making my original ‘garden’ platters back in April this year, one of the most exciting things I found about this new work was the potential of paper cuts as resists for decorating with slip and underglazes. So I have been expanding upon the theme in the last few days, and have really enjoyed it. I was also invited to send some work to the Oriel Myrddin gallery in Carmarthenshire for their Christmas exhibition, which is called ‘Forest’. 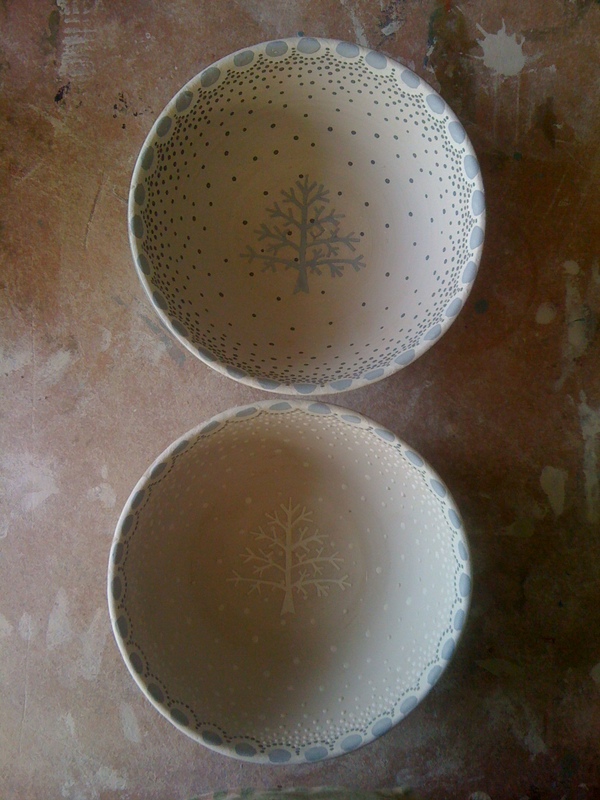 I thought this theme was too much of a coincidence with my recent development work to resist, and so have been getting a little carried away with winter forest scenes on bowls and platters! 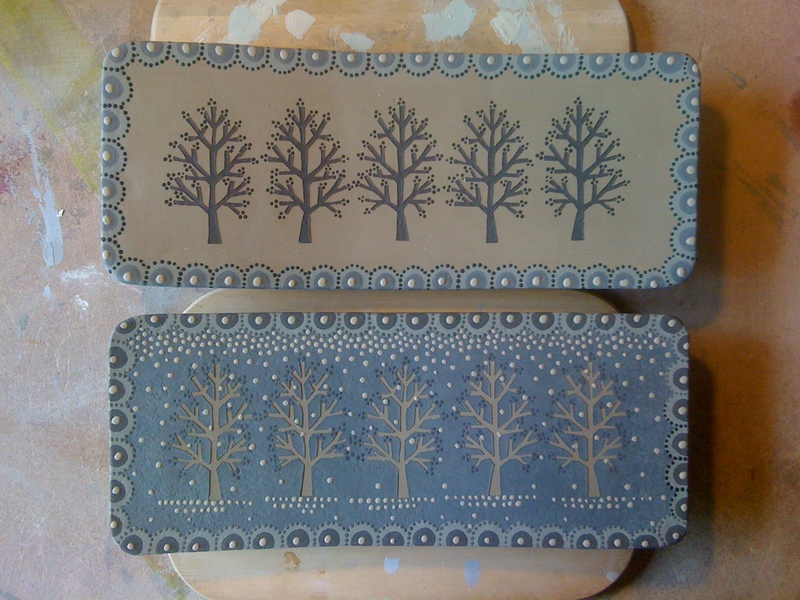 I haven’t fired any of it yet, but I do like the soft colours and matt surface of the prefired work, so here are some photos…. 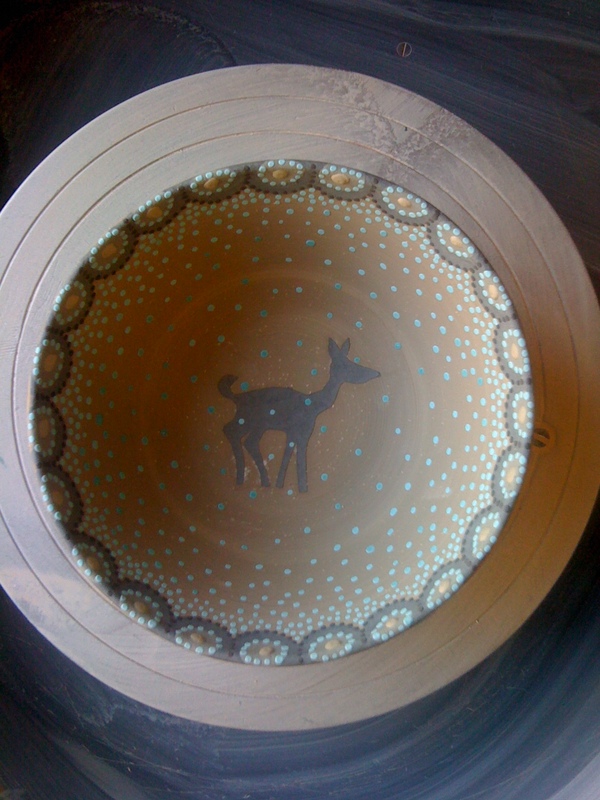 I’ll add photos of the finished items when they are all glazed and out of the kiln. Hi. I seem to come have discovered your work at a time when it is changing. 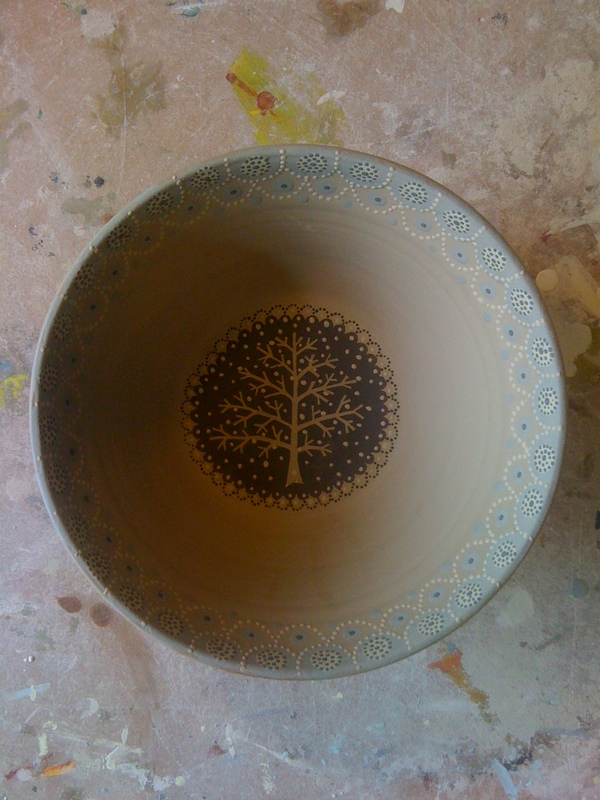 I saw an article in a magazine and loved the pots you were creating. I looked up your wesbite and found that all is changing. I gather you are not making your household pots this year, which I am sad about, but would wish you well with your new developments and I will try to keep an eye out for them. Thankyou very much, Sue! Maybe you can come and visit my studio if you are in Nottingham any time..
Hi Katrin, I have just read the article about you in Country Living and am bowled over by the beauty and energy of your work. What an inspiration! Katrin, I first saw your work when you were first stepping out at Origin…I wish I had trusted my instincts then and bought a piece of your work as it has changed over the years-not that that is a criticism but it has evolved. You so deserve the recognition and success that you are clearly getting and I hope your family appreciate how clever and hard working you are! I did make it to Made in London but it was quite dark and frenetic and I would love to see your work again in more peaceful surroundings as it merits that. any suggestions?! Hi Lesley, yes I am sorry my website is down at the moment… I do most of my updates on my facebook page, http://www.facebook.com/katrinmoyepage – otherwise please email me for order details at katrin.moye@ntlworld.com thankyou!